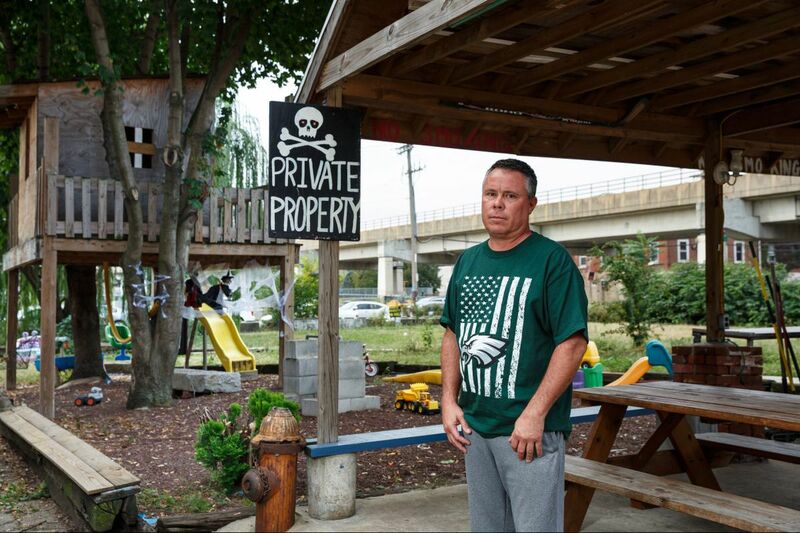 Frank Galdo has turned a vacant lot across the street from his house into his family’s playground. He says he’s maintained it for 28 years. On clear nights, Frank Galdo huddles with his wife, Nicole, and their three children in the pavilion that he built on the lot across the street from their Fishtown home. Together they watch the sun set. Galdo bought the house on Front Street near Lee from his grandmother in 1989 when he was 20 years old. Almost immediately, he started cleaning up the overgrown space across the street, which had been home to prostitutes and drug users and a magnet for short dumpers. Twenty-eight years later, the lot sports a fire pit, tree house, picnic tables, two maple trees, and a weeping willow, all put in by Galdo. He laid concrete for parking space and seeded the rest, so his kids and dog can play in the grass. A sign on a trailer parked on the lot — visible from the Market-Frankford El, which runs parallel to the property — calls it "The Notorious Galdo Parcel." Another sign, on the pavilion, dubs it "Sunset Ave."
The Galdo family, including Frank and his wife, Nicole, refer to the lot as “The Notorious Galdo Parcel.” The sign can be seen from the Market-Frankford Line, which runs parallel to the property. The problem is, the City of Philadelphia owns the lot and wants it back. City officials posted a notice in 2013 that stated Galdo's use of the land was unauthorized and demanded all personal property be removed. Instead, Galdo called a lawyer. Three years later, the city won the first round in court, but Galdo appealed. The case is scheduled to be heard Tuesday in Commonwealth Court. "It's home," said Galdo, a lifelong Fishtown resident. "I couldn't live here without this [lot]. I couldn't stand to watch them tear it down in front of my kids." Galdo argues that he's entitled to the land because of "adverse possession" — a legal doctrine that allows someone to claim property by proving possession for 21 years. He has documented his renovation of the Galdo Parcel with pictures dating to 1989, including a snapshot of him painting "God Bless America. The Land of the Free, Home of the Brave" on the trailer days after 9/11. The city condemned the property in 1974 to temporarily reroute the Market-Frankford Line, since the construction of Interstate 95 interfered with the track. The city is listed as the property owner in its records, but Galdo contends it hasn't used the property since 1976. Galdo's lawyer David Scaggs, of the Granger firm in Chester County, and the city's Law Department declined to comment on the case because of ongoing litigation. Amy Sinden, a Temple University professor who specializes in property law, said the idea behind adverse possession is that the owner of the property is not behaving like an owner. "If you're talking about city property that's been blighted and causing harm to the neighborhood, like what sounds like is happening here, then this doctrine says maybe we should reward" Galdo, she said. While cities are subject to adverse possession claims, states are not, Sinden said. The Court of Common Pleas ruled in 2016 that the city was immune from adverse possession because it was acting as an agent of the state when it condemned the property. Galdo based his appeal on the lack of a record of the agreement between the state and city about the property, he said. David Fectau of the Philadelphia City Planning Commission testified in the 2016 hearing that the city had not used the property after the 1970s, as did Philadelphia Industrial Development Corp.'s Ilene Burak. Fishtown resident Nancy Klenk, a 33-year employee at the McDonald's on Front and Girard Streets — where Galdo worked when he was 16 — testified that before Galdo began caring for the lot, "shady stuff" happened there. "There was weeds. There was prostitutes. There was derelicts and everything. So I do know that whoever did own that property … did not take care of it," she testified. Galdo attributed the city's recent interest in the lot to the spike of property values in Fishtown. According to Trulia, a database tracking housing sales and prices, the median sales price of a property in Northern Liberties/Fishtown has increased from $64,000 in January 2000 to $355,000 in July 2017 — a 280 percent increase, adjusted for inflation. Waiting for a decision has left the Galdos "in limbo," Nicole Galdo said. Unsure whether they're staying, Frank Galdo stopped renovating the lot and his home. "We are just at a standstill," she added. "It's a waiting game." Frank Galdo plays with his children on a tree house Galdo built in the lot across the street from their house. Galdo and his five siblings, raised in a rowhouse around the corner, built forts and rode minibikes on the lot as children. In his 20s, Galdo sat around a fire there and drank beer with friends. Now, he hosts his kids' birthday parties on the parcel, occasionally renting inflatable water slides. From the lot, he can see the steeple of the Immaculate Conception Roman Catholic Church, where his grandmother and grandfather met and married, where his three sisters also married, and where he and his children were baptized. Losing the lot and all of its memories would be devastating, Galdo said. "I can't sleep," he added. "What am I going to do if I lose? I couldn't tell you. … I'll never see a Fishtown sunset again." Nicole Galdo and her children (from left) 4-year-old Francis Joseph, 7-year-old Chloe, and 6-year-old Bella Galdo, play in the lot. The steeple of the Immaculate Conception Roman Catholic Church, where all of the kids were baptized, is in the background.